Sue Chenoweth and Nina Solomon worked on the design phase with the students, listened to their ideas and then constructed a model. 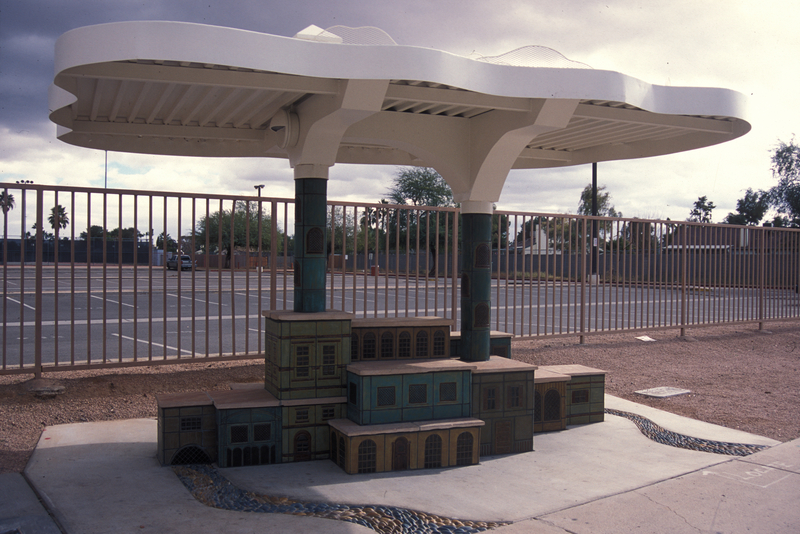 The shelter, “Cloud City”, was based on the city designs of M. C. Escher, whom the students admired. In an actual structure, the design couldn’t play with the impossibilities of physical space as Escher did within his two dimensional plane drawings. So the students and the artists decided to play with scale. 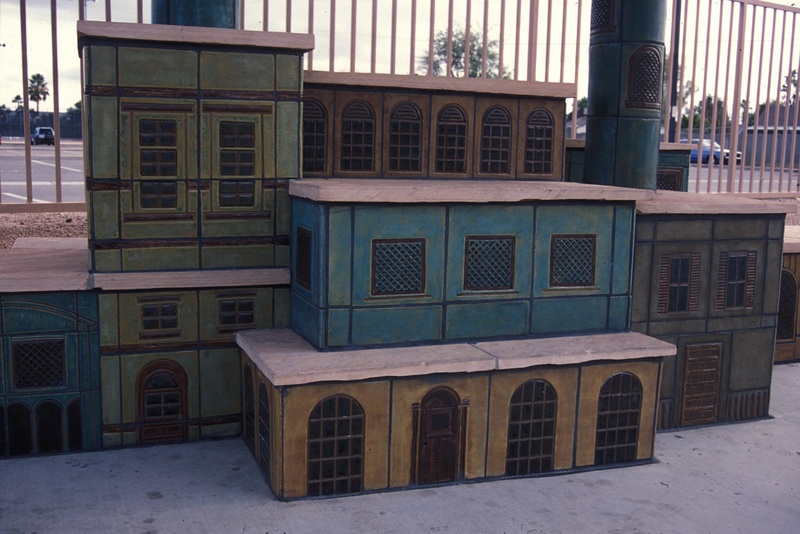 They created a complicated grouping of masonry boxes that are faced with tiles depicting architectural features such as doors and windows. The ‘roofs’ of the ‘buildings’ are flagstone and become the seating area. With no one sitting in the shelter it looks all in scale, buildings, columns, arches, roof. However as soon as anyone sits down on the roofs of the ‘buildings’, the scale is thrown off by the Gulliver-like people sitting on the Lilliputian town. After the design phase, Nina worked with the students making some of the architectural tiles for the faces of the ‘buildings’, and then finished the rest in her studio. Nina also handled the engineering and fabrication supervision. 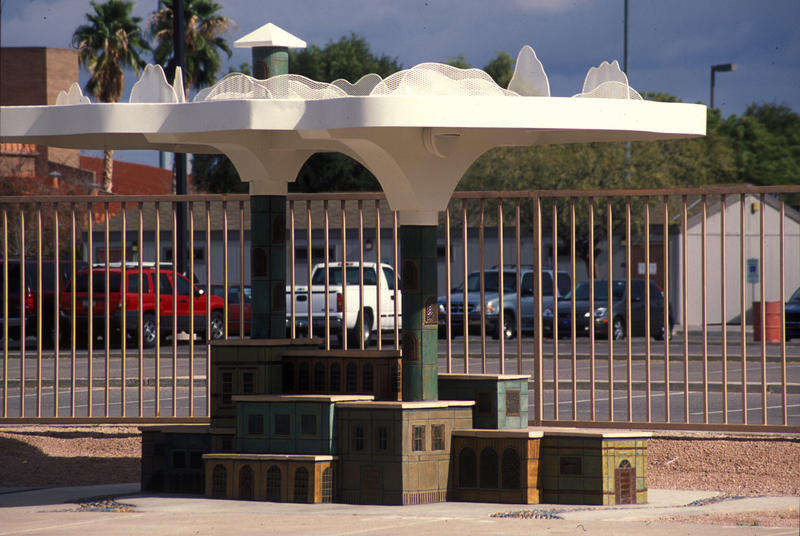 The canopy design is an 18-foot steel cloud supported on pillars by Escher-like arches. Sue came back into the project during installation to create the pebble mosaic ground treatment.